EEK! I can’t believe I cut the fabric too short. I thought I had measured and measured and measured. Somehow I messed up. Now I have to shorten the pattern leg length some more so the pattern can be laid out! This is part of the fabric stash I bought at the estate sale for $10 so I am not too upset. The length of this 45″ wide piece was something like 7 yards. I screwed up and cut what I thought was the amount of fabric I needed. (I will use the ill gotten cut fabric for something else.) The remaining fabric will work as long as I shorten the leg length on the pattern another inch or so. I am 5’1″ and my legs are very short. I am making the red split skirt in the middle so it shouldn’t be too much a problem. The project is really a muslin and a horrid color so the length does matter too much. I only intend wearing it around the house. I don’t think the split skirt is is going to look very good on me. I am an “A” shape and the gathers might just emphasis my too big derrière. Too bad, I want to wear this. I am going to make the vest in some kind of “loud” fabric which will draw the attention to my upper body. It will be the person looking at me wearing the outfit, not me, who has the problem. Sometimes you just have to do what you want to do. 10.PM I got the pattern altered and pinned to the fabric. There was just barely enough length. I wound up shortening the length by 1-1/2 inches. Tomorrow it gets cut! I wish there were a 12-step something or other for Blog reader junkies. 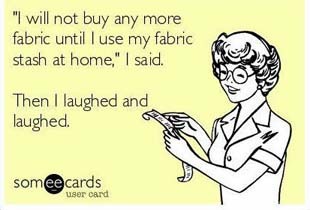 I read blogs to help me with my sewing, except I read too many of them and I don’t get around to do any sewing let alone anything else. So please bear with me as I curtail my blog habit. Don, who is 82 years old, recently took up embroidering and quilting. 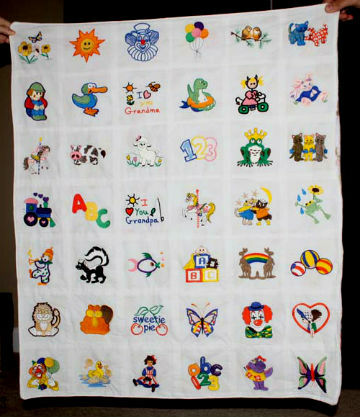 This is the quilt he made for my daughter’s and son-in-law’s new baby born on December 11, 2013. Of course, the baby is gorgeous, but Don did a gorgeous on the quilt, too. I didn’t help him sew a single stitch! He bought, planned, cut, and sewed everything himself! As mentioned before I have returned to sewing after a 25-year hiatus.. I was pretty excited until I figured out that it is going to be difficult for me to be satisfied with any garment I have sewn unless it is perfect. I know this is an impossible task. RTW is never perfect either. I want my finished garment to fit me perfectly. The seams must be sewn straight. The seams must match if the fabric requires it. Zippers must be sewn in absolutely straight. Facings cannot show. Linings must never show. All seams should have a professional finish. Topstitching should be even. Buttonholes must be evenly placed and the placed correctly from the edge of the fabric. Hems must be even when required. Elastic is forbidden to roll over in skirt/pants waistbands. The fabric type and color must reflect what the finished garment should look like. I am sure there quite a few more I will chance upon as my sewing journey continues. I could be so happy with any sewing project if I could meet all my ridiculous rules. I really want to sew so I must be lenient with my rules if I am really going to do! I also can’t seem to start a new project until the previous one is finished. I am making my fourth muslin for a pair of pants as described in my previous posts. Every time a make a small change it seems to affect everything else. I am now incorporating all the alterations I have made and sewing out the new muslin. I think I may be getting over this perfectionist thing now because I have decided if the pants might not fit perfectly or have some flaws when they are finished, I will accept it. I am tired of spending so much time on this project . There are too many other things to I want to make. I want to make a Boppie Pillow cover for my first grandchild born on December 11. I want to make some new skirts and tops. I want to make some pants. I want to make bibs. I do have a lot of wants. Let’s hop e I can start the new year by getting to work on them! The learning curve for using a Olfa cutter is very, very fast! All you need to do is slice your finger once and I guarantee you have immediately learned how to use it! Well, now that I have the blog working I can start working on my sewing! I traced and cut out the pants pattern again today. (See previous post.) I am making all the previous alterations plus some new ones. The front of the last trial pants I made fit fine so all I have to redo is the back. Hopefully, I can get them sewed out tomorrow. They have to fit this time. I wouldn’t know what else to do now!